By Natalie Stone, MSN | Neal James, who appeared on Animal Planet’s Call of the Wildman, has died. He was 55. James died Friday, Feb. 1 at approximately 1 a.m. at his home in Kentucky, Deputy Coroner Freddie Carey of the Washington County Coroner’s Office confirmed to PEOPLE. Though James died of natural causes, he had been battling heart issues, Carey said. 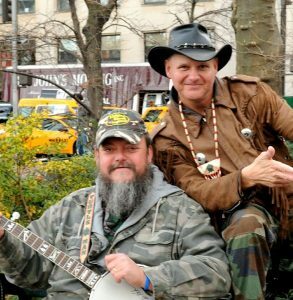 He was known as “The Banjo Man” on the reality series, which ran for four seasons from 2011-14. He appeared alongside his friend and star “The Turtleman” Ernie Brown Jr. According to WKYT, James worked at the Isaiah House Treatment Center, which “is an outpatient, intensive outpatient and residential treatment program with a Gold Standard of care for men” who are recovering from addiction, according to the center’s website. 6: Carlos Fernando Nogueira, 59–60, Brazilian singer, architect and graphic designer. 5: George Klein, 83, American disc jockey (WLFP) and TV host (WHBQ-TV), complications from dementia. 4: Giampiero Artegiani, 63, Italian singer-songwriter; Matti Nykänen, 55, Finnish singer and ski jumper, Olympic champion (1984, 1988); Vyacheslav Ovchinnikov, 82, Russian composer; Zbigniew Penherski, 84, Polish composer; Kulyash Sakieva, 98, Kazakh singer and actress. 3: Detsl, 35, Russian hip hop artist, heart attack; Peter Posa, 77, New Zealand guitarist. 2: Tim Landers, American rock guitarist and singer (Transit, Misser); Bill Sims, 69, American blues musician. 1: Ayub Ogada, 63, Kenyan musician. 31: Harold Bradley, 93, American Hall of Fame country musician; Johnny Lion, 77, Dutch singer and actor, lung cancer; Harri Marstio, 62, Finnish musician, traffic collision. 29: James Ingram, 66, American R&B singer-songwriter (“Baby, Come to Me”, “I Don’t Have the Heart”, “Yah Mo B There”), Grammy winner (1982, 1985), brain cancer; Sanford Sylvan, 65, American baritone, heart attack.